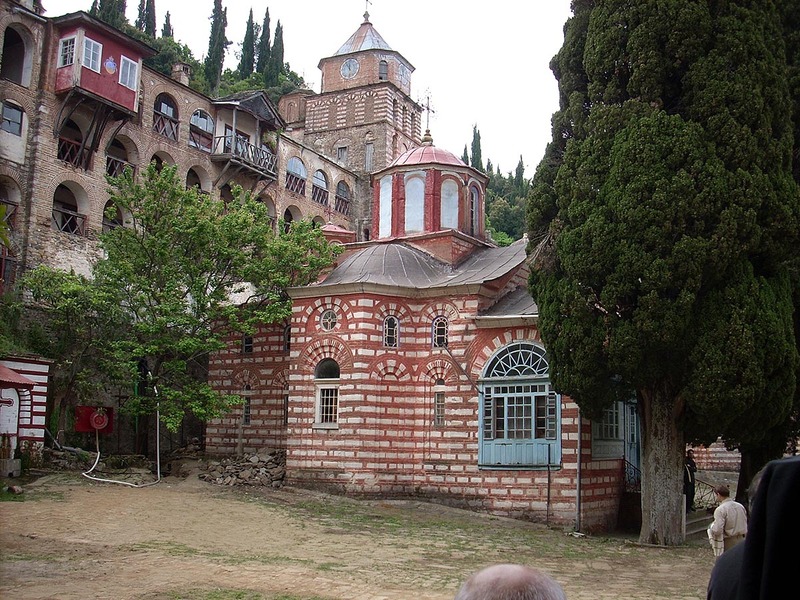 Monastery Zografou celebrates on the 23rd of April in honor of Agios Georgios. It was founded in the 10th century by three brothers from Achrida Moeses, Aaron and Ioannis in the years of Emperor Leonta Sofou. 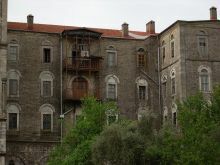 In ancient documents it is referred to as Monastery of Agios Georgios Zografos. In the 13th century it is also referred to as Monastery of Bulgarians. The Monastery of Zografou is located at the first row of monasteries at the south west beach area of the peninsula in an altitude of 160 m and a 40' distance from the beach and just 3.5 hours from Karyes. 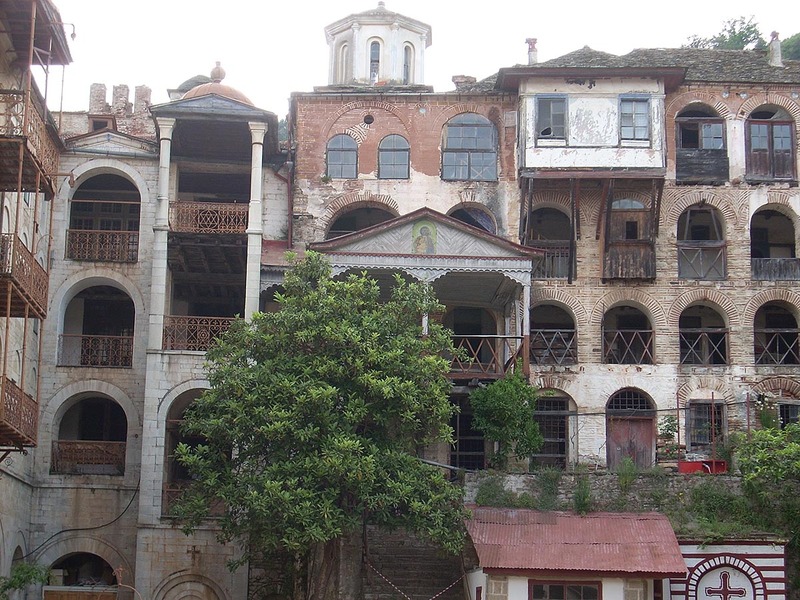 It is the 9th in the hierarchy of the monasteries in Mount Athos and its advantageous position saved it many times from disaster. 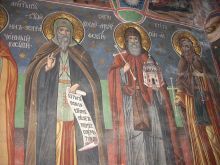 The first historical source that mentions the monastery is the first document of 972, the 'Goat', which is also signed by the abbot Georgios of Zografou. It is very likely that Bulgarian monks lived at the Monastery since then but unfortunately we know very little about their history until the 13th century. 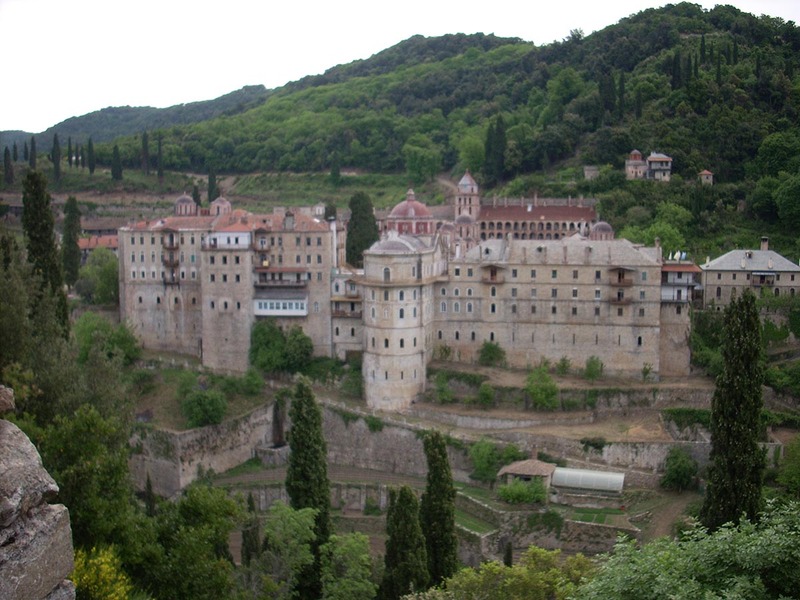 After the 13th century the monastery was profited from both Byzantine emperors and Serbian sovereigns. 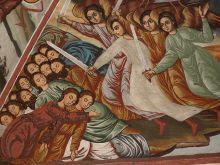 Also at the end of the 13th century soldiers of the Emperor Mihael Paleologos VIII in collaboration with the Patriarch Ioannis Vekkos tortured and burned alive 26 fanatic monks opposing to the union of the Monastery Zografou. The memorial that was built in 1873 at the courtyard near the entrance of the Monastery, certifies us that this fact took place in 1276. 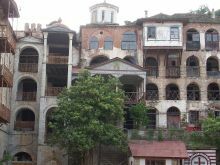 But ultimately Mihael was the one who helped with generous subsidies the 'Bulgarian Monastery΄. Major disasters were also caused by the raids of Catalan mercenaries in 1307-1309. 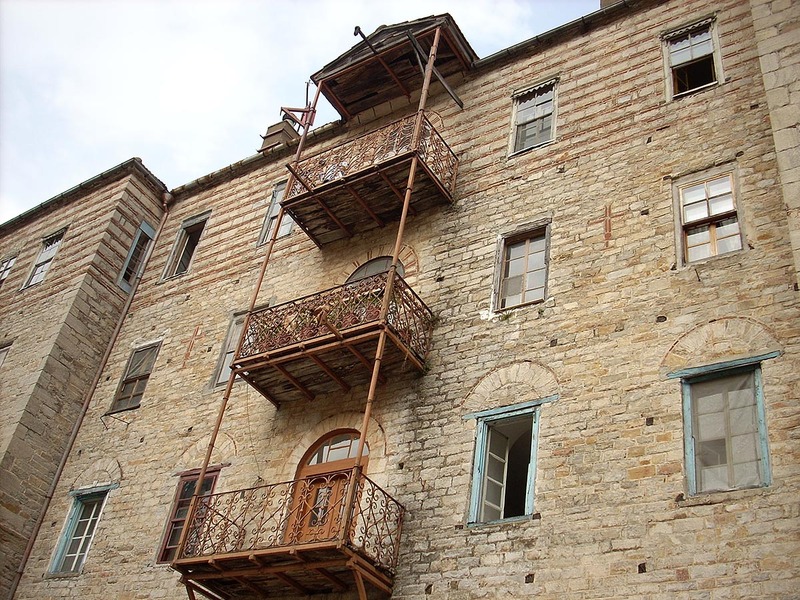 Almost all the buildings that have survived until today belong to the 19th century. 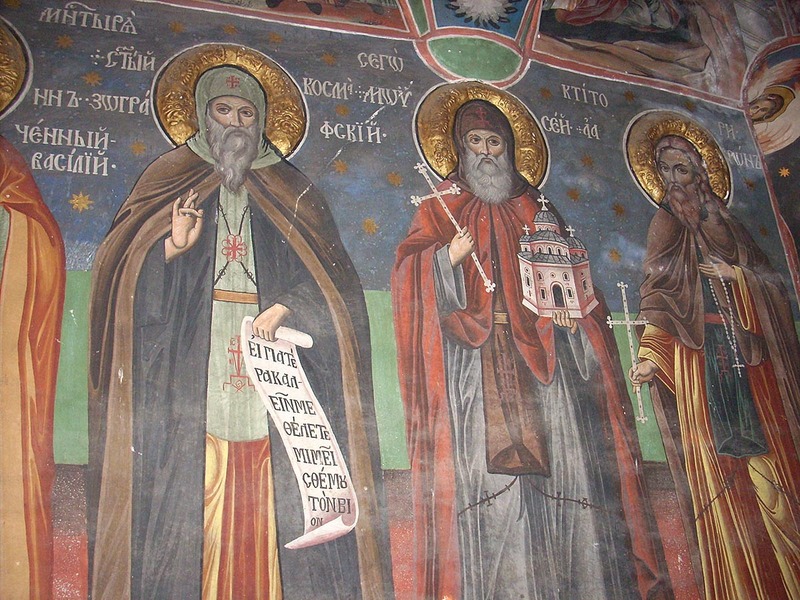 Financial support for the construction was offered by Serbian kings and the Paleologoi emperors of the Monastery. 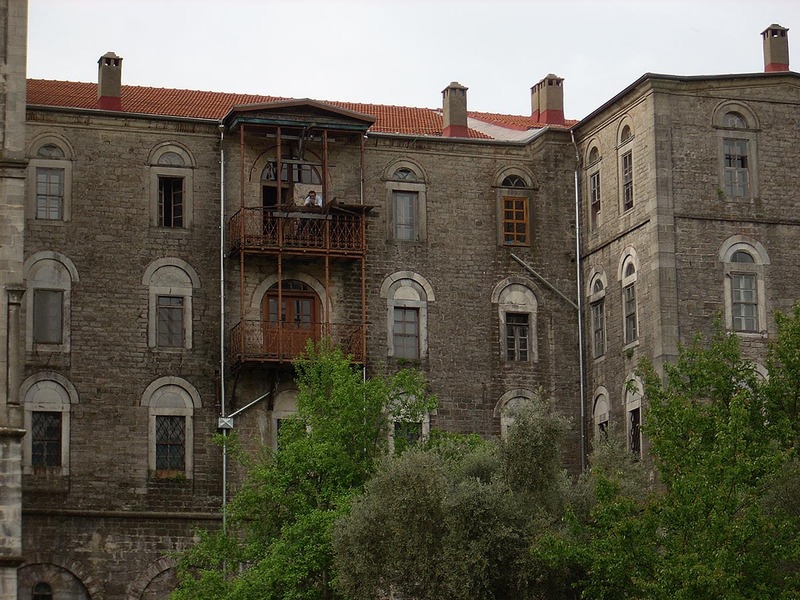 In the years of the Turkish occupation the monastery Zografou was also supported by rulers of the Danubian countries. In 1502 the monastery was renovated by the ruler of the Danubian Principalities Stefan VI the Good. 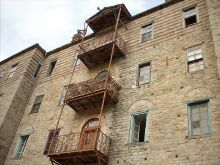 In 1716 the east wing was repaired, while from 1862 to 1896 the northern and western sides of the Monastery were built. Since 1845 the Bulgarians had prevailed. The last fire broke out in 1976. 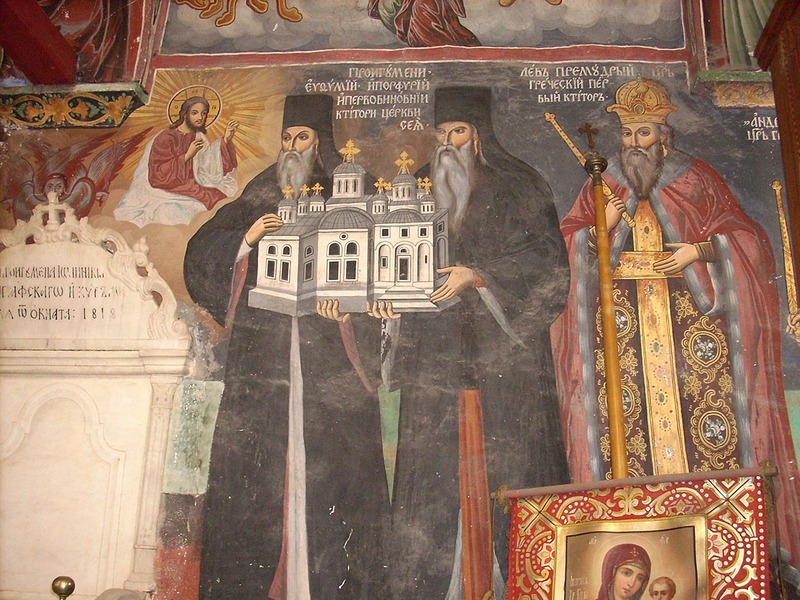 The Katholikon, built in 1800, was painted with murals in 1817 while the narthex in 1840. The dome of the stoup is held by eight pillars. In its center there is a fountain. North of the Katholikon there is the church of the Assumption of the Virgin Mary built in 1758-1764 and painted in 1870. From the 16 chapels, 8 of them are located within the Monastery itself. Above the Prothesis, which was built in 1896, there is the church of Agios Cyrilos and Methodios. The library, which is housed in the tower of the monastery, contains 10,000 printed books, several manuscripts in Greek, a few rare Slavic and Bulgarian manuscripts and particularly valuable codes. The most important is the Bulgarian code no. 17, the hymnbook of Ravomir in the 13th century. It should also be mentioned that there are 3 Slavic manuscripts, the Minologion (book of months) of Dragan from the 13th century with descriptions of the lives of the martyrs, the Slavic code no.28, a book of 4 Gospels in Slavic from 1569 and finally the Slavic code no. 1, the first record of the history of Bulgaria written by monk Paisios in 1745. In the sacristy there are the remains of saints and many sacred relics, canonicals, functional utensils, wooden carved crosses and many pictures. One of these is Panagia Epakouousa. 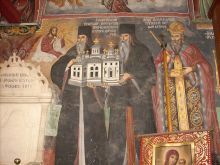 Apart from the first picture of Agios Georgios, which is covered with gold, silver and diamonds and is directly associated with the history of the establishment of the Monastery, among its main pictures you can find a second image of Agios Georgios, of Arab origin and a third one which was a gift from Stefan IV of the Danubian Principalities in 1484. Guests should visit the Katholikon which features the picture of Agios Georgios, the monument of the 26 painters martyrs in the courtyard of the Monastery and the library with its codes in parchmentof the 12th-13th century. The following story describes that the pious monk Kosmas was troubling about which is the best way to approach God and save your soul. As he was wondering on that, suddenly he heard a heavenly voice ordering him to leave the Monastery and to live the rest of his life as a hermit.